But, not one to be deterred, I decided to set off on a different cheese path. If Cheddar is one of our quintessential British cheeses then so too is Stilton (don’t laugh). And it also demands a range of different ingredients and techniques which appealed to me. I knew that it wasn’t going to be easy for a legion of reasons but this time I meant business. I threw away my previous batch of rennet tablets and the pots of culture I had made ; they had never seemed to yield a very good curd for me bad workman blames tools etc. 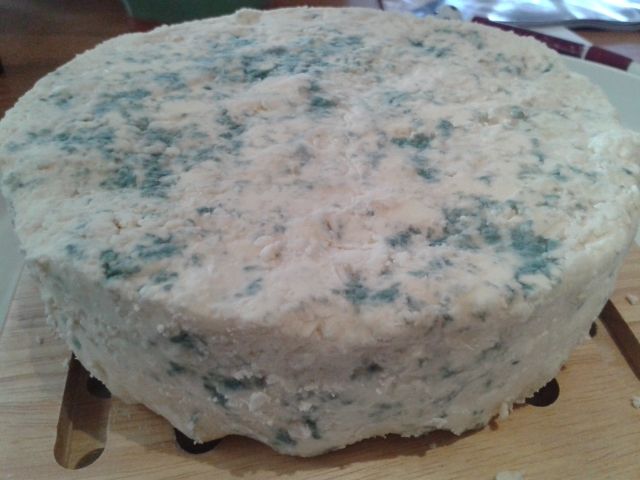 I pondered for a while about whether to go back to basics and blue my Stilton the old-fashioned way. 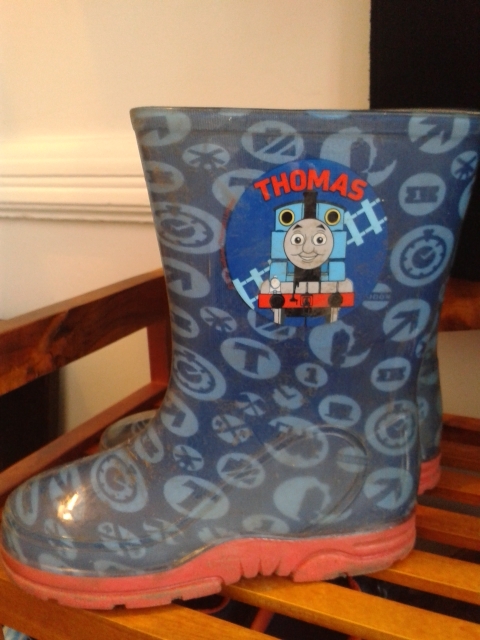 Judging by the literature, my choices to encourage mould appeared to be using well-worn boots or perhaps an old horse harness. Boots we could do but I was pretty sure that the local cultures from dog poo and fag butts weren’t going to produce the desired results. Horses were out, my cat does not qualify as a working animal according to any definition and again, my son’s pet worms seemed like a bit of a gamble. 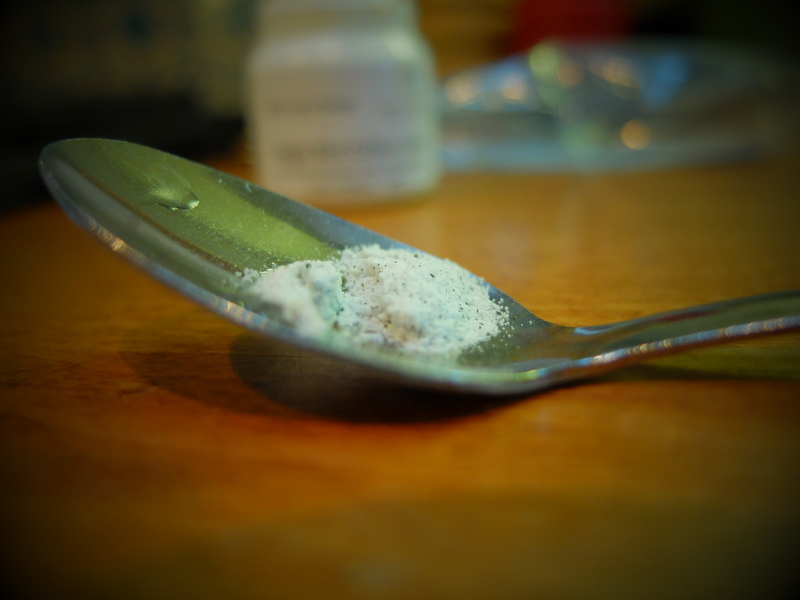 So reluctantly I conceded to modern ways and ordered in a whole lot of new cultures, including the all-important Penicillium Roqueforti. I consulted several other blogs whilst I was gearing myself up for the next steps, so big thanks go to The Greening of Gavin, Much To Do About Cheese and Handyface. All of these chaps are far better at home cheese-making than me and have actually produced edible specimens that haven’t killed anyone (or perhaps they’re keeping quiet on that particular point). Gavin very kindly provides a recipe and podcast on his website and so blame him if it goes wrong it was this that I followed. The first big decision was the milk. 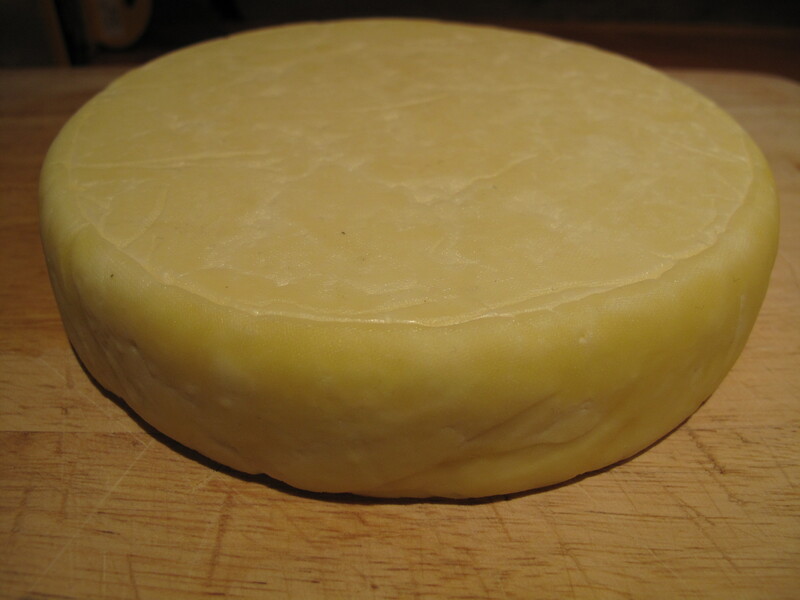 I have previously gone with raw milk for my cheeses but it didn’t seem to make much difference as to whether the cheese was a hopeless failure or not, so this time I thought keep it simple and bought – shock, horror – pasteurised supermarket whole milk. Given that Stilton has to be made with pasteurised milk, this will also help when I seek admittance to The Stilton Cheesemakers’ Association (although they may still have to bend the geographical rules for me slightly). So, we were off: 7.6 litres of it went into a large pan with 500ml single cream. And partly because, despite my love of blue cheese and understanding of how it’s made, it still feels slightly wrong to try and encourage food to grow mould. I then gently heated the whole lot up to 30˚C before adding the mesophilic culture (¼ tsp), putting a lid on the pan and leaving it for 30 minutes. I then added the rennet; I was giving liquid rennet a try this time, about ¼ tsp dissolved in 60ml of cooled boiled water, stirred in well. 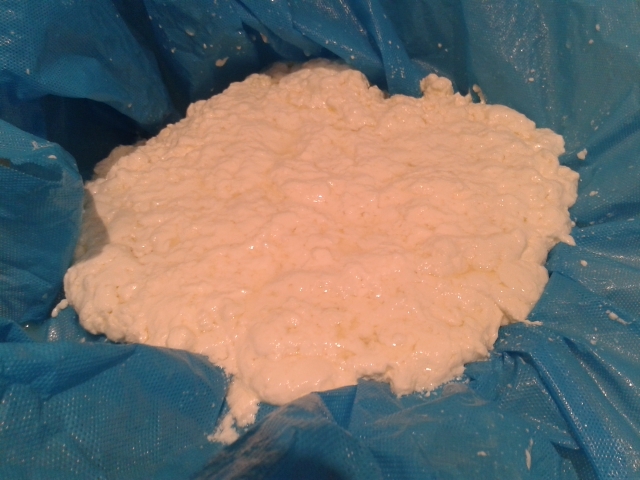 It was now time to leave it for 90 minutes to let the curds set. It was a tense moment when I lifted the pan lid. This is usually the moment where it all starts to go wrong. I was anticipating something that looked like a meagre handful of cottage cheese floating in some barley water, which is often what I manage to achieve. But look! It was a lovely firm set and a clean break! Whoopee! I ladled the curds into a colander (this one is lined with some special cheese-making stuff that Kristen from Gringa Dairy kindly gave me) and there was so much curd I wasn’t sure it was all going to fit in. I left it to drain for another 90 minutes and then constructed this rather natty device to drain it for a further 30 minutes. It was then lightly pressed on the draining board overnight. The next morning I broke up the curd (loads of it!) into thumb-sized chunks (technically called ‘milling’) and mixed 2 tbsp of cheese salt well into it. 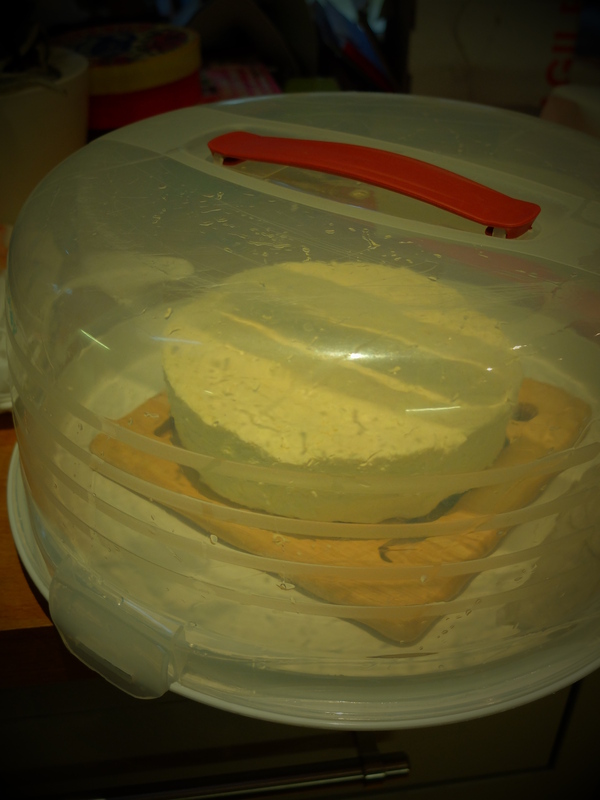 I then pressed the curds into my improvised cheese mould, lined again with muslin. 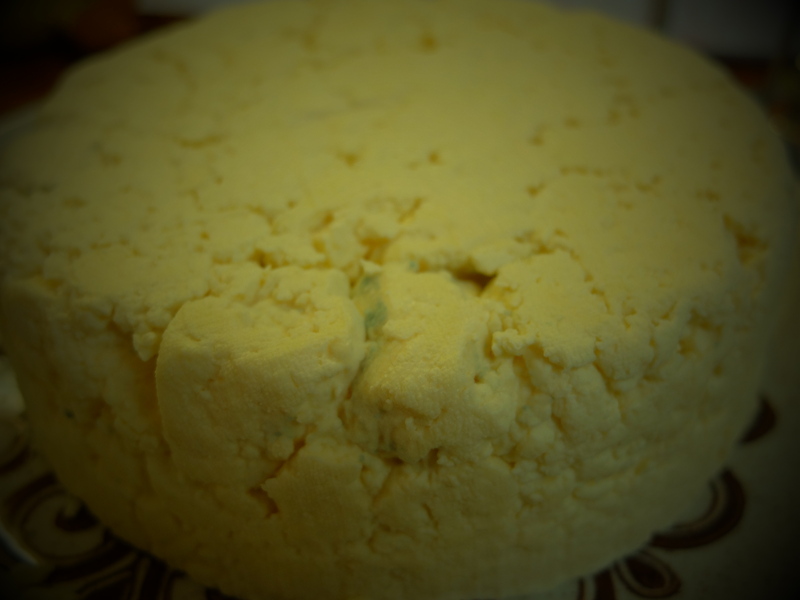 Stilton is not a pressed cheese as there need to be gaps amongst the curds for air to circulate and the mould to grow in. For two hours I flipped it every 15 minutes and then over the next four days it was turned four times a day. By this point, there was a distinct blue cheese smell in the air. As you can see, it has a very rough and craggy surface because it hasn’t been pressed. You can also see the odd whisper of blue mould starting to grow on it! I decided to pierce it next; this allows air in so that the blue mould culture can start to grow. I know that some people do this step later down the line but Gavin’s podcast said to do it now and I was worried in case my cheese dried out whilst ageing and collapsed at the thought of being pierced. It was another tense moment, as I pushed the sterilized thermometer stem into the cheese but all was mostly okay, until I got bold and went too near the edges. There was quite a bit of collapsing and cracking going on but I think I managed to cobble it all back together. 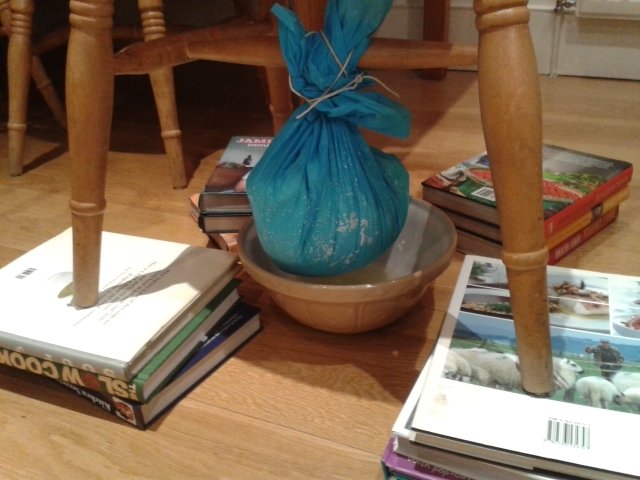 So now, the Stilton must descend into the dreaded cellar. It’s actually a perfect temperature for cheese down there at the moment. I don’t have anything approaching a fancy cheese cave and so he’s gone into a sealed Tupperware cake container. Now, I’m no expert but he looks pretty good to me! What do we reckon, cheese-making expert dudes? He’s still nice and moist but actually is cracking far less now when I turn him. I hope that this is all good news but as ever with these things, time will tell. Any tips gratefully received. I can’t tell how much I laughed reading this (in a good way, at the right bits) or how hugely impressed I am by your Stilton venture. Way to go! It looks amazing. Can’t wait to see how he turns out – how long will he take to mature properly? Name? Maybe something alliterative – Steve The Stilton? Stanislaus? Stinky? Is is mum going to be there? Very impressed, and that means something coming from someone who ‘made’ about 200gms, twice, of inedible cheddar 30 years ago and is now about to embark on a goat’s cheese making extravaganza. Now, where did I put the goat ? Ah yes, I’ve been there with the inedible Cheddar! 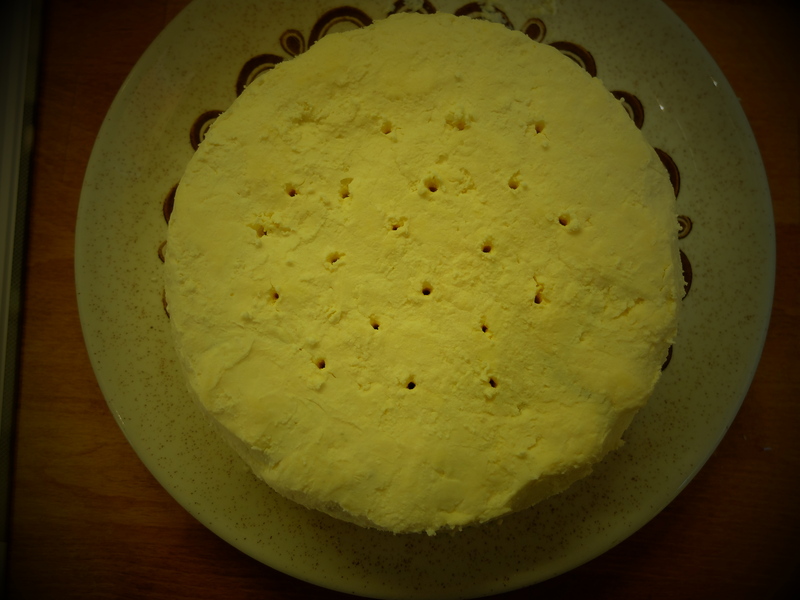 Goat’s cheese-making sounds exciting – soft chèvre types or something a bit older and…er…goatier? Going for a firmer type. I hope ! @robcmar tomorrow afternoon with pics. I’m no cheese maker but that looks lovely! How long until this one is ready? Wow. I am extremely impressed, and really looking forward to the next installment in the tale! I’m quite nervous…I feel strangely protective! Wow!! Nice job. I am very impressed. You made cheese-making seem, easy, which I’m sure it wasn’t. Or maybe it was for you. If I tried, I’m fairly certain it would explode all over my kitchen or leak in odd places, but this looks like cheese. I can’t wait to see how it turns out after it’s had time to age!! 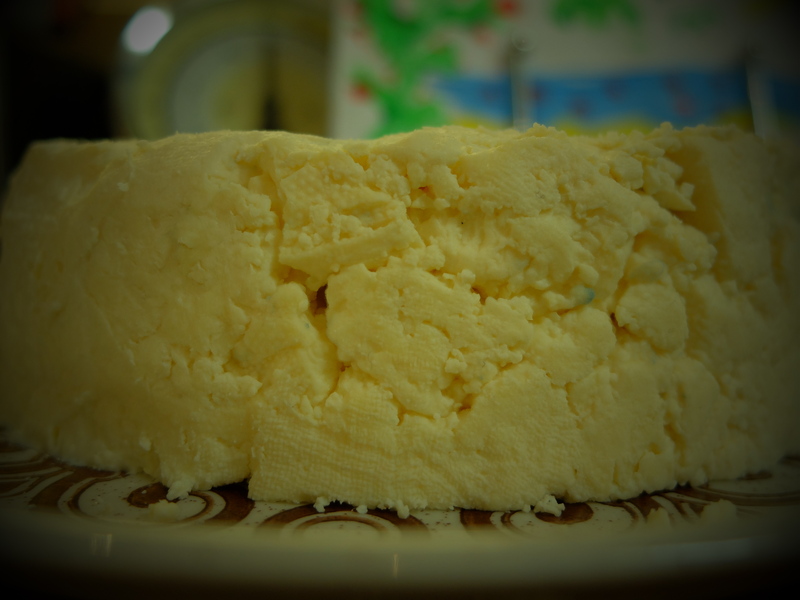 Oh, I made a right hash of it the first time I tried it – if you look back on the blog you’ll see the first Cheddar I attempted collapsed in a heap and had to be chucked out! Let’s see how this one turns out; I’ve tried harder this time! Wow, I’d love to give cheese making a go. How long until you can have a nibble of Trevor? So in awe that you’re making stilton! Well done, it looks amazing so far. Oh my goodness though, you’ve just reminded me I have a semi-hard cheese abandoned in the unheated upstairs room that I’ve forgotten to check on for ages! Ha! It’s easy to forget about them; poor Colin got neglected a lot which was probably why he turned out so horrid… What kind of semi-hard is it? Aaah, Cheese Smiles with Lanark Blue – perfect! I am under no illusions that this one will turn out well – I don’t trust any of ’em 😉 What are you making at the moment? 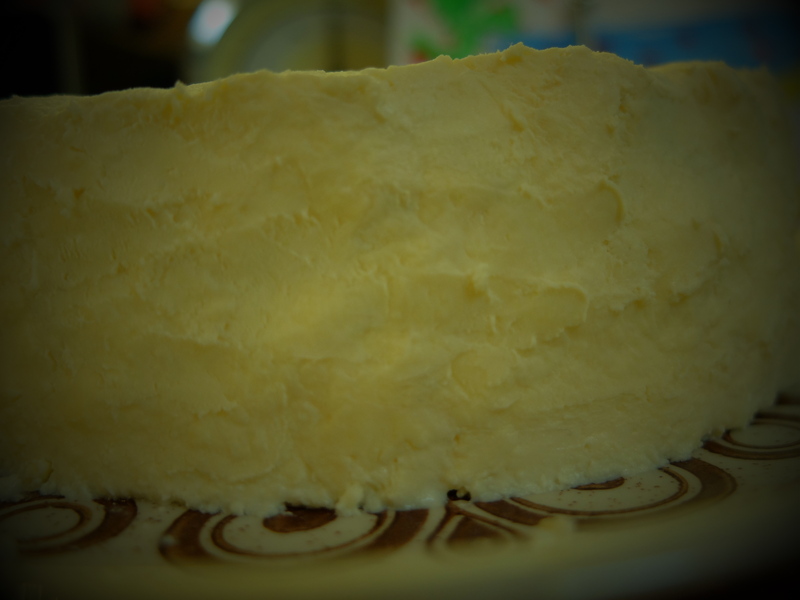 Currently very sidetracked by cultured butter – which if you know the history of Suffolk Cheese is a very funny joke! – seriously loving the butter and getting braver and braver with culture times -current one aiming for a week if I’m brave enough. Planning my next season of cheese making back at Easton Farm Park just tidying up some details before going to press. Have also just bought a load of supermarket goat’s milk to see if I can produce an acceptable chevere ahead of local goats coming back into production. What is your next project ahead of Little Boy [my nickname for your blue] coming to life? Thanks! I have Spotify somewhere but am a bit of a techno-idiot! I think my next project might be some simple soft cheeses but flavoured. I have been reading Valerie Cheke’s book of cheese history and how they used to use herbs, as well as garlic and caraway, so might give it a go, perhaps when my herbs are a bit more plentiful. Cultured butter sounds lovely – as does goat’s cheese. Do you plan to one day sell your cheeses? At the moment I have embarked on a two year project of research and testing to see if my ideas develop into something worthwhile. As I don’t own a herd and would like to stick with the ‘very artisan’ approach I’m not sure it would make a viable business. However, if I hear a clamouring at the door who knows – never say never. however, I would be interested in talking to groups etc about the lost cheeses of Suffolk and might try to promote that aspect later in the year. I do hope Trevor turns out to be the mother of all Stiltons! I say call him Steve. Steve the Stilton. Love your work. Thanks 🙂 Yes, Steve could work. Although Trevor seems to be sticking! I think you have done very well. The mould growth looks about right, and as long as you scrape off excess mould once in a while, it will be all good. Thanks for a great podcast. I’m a bit worried about ageing it but we will see! Great looking cheese so far. Haha, yes, it’s a hi-tech dairy here! Yes, it’s definitely funnier when things go wrong but I do quite want Trevor to be edible! The ageing is the hardest part though so plenty of time for him to turn into a monster! Oh the suspense! Like an episode of Neighbours! Can’t wait for the next installment. Trevor’s looking great! I definitely admire you for trying a blue. Would you mind sharing a little more on how you made the mould? I mean the mould to shape the cheese. 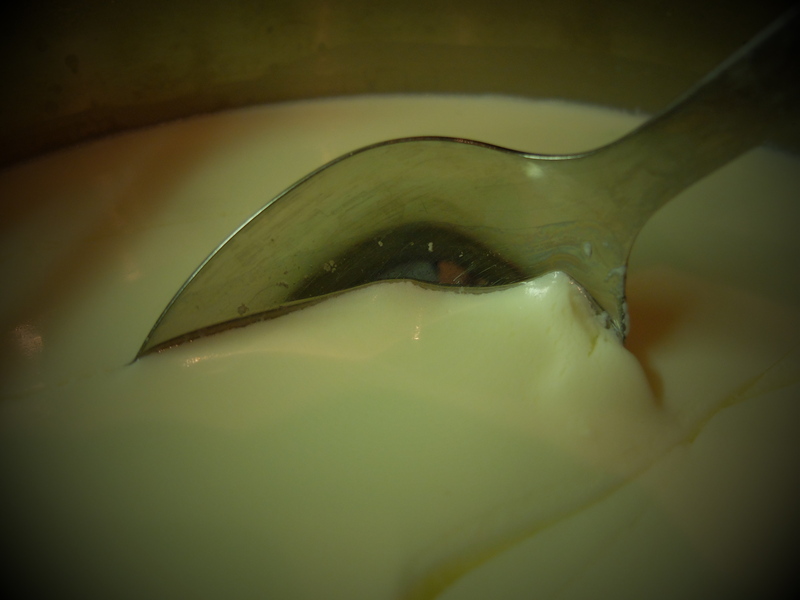 The only cheese I’ve ever made was accidental cottage cheese in the bottom of a jug of milk. Good luck with Trevor, and let me know if you use him to make St David’s Day Pasta! It’s gotta be Peter – Peter Stilton (Shilton) ! (and i’m not even a footie fan). I’ve got one on the go as well, no name yet though. Argh, now why didn’t I think of that – genius! How old is yours? About 10 days. 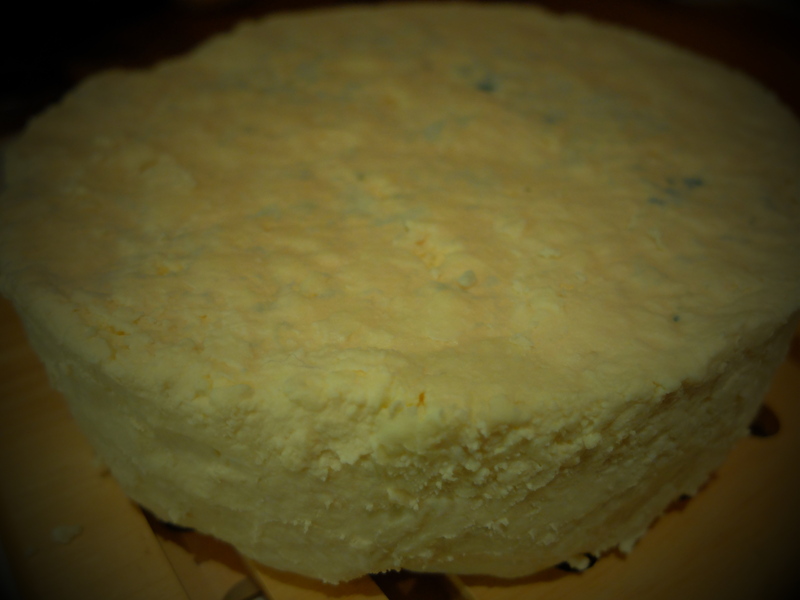 I think i used too much roqueforti or something because it was almost totally covered in blue/green mold after a week but i scraped it and am now optimistic it will be at least edible. My Stilton is similar then. I gave him a good scraping at the weekend but haven’t looked for a few days so he probably needs another going over. Oh, and i had reasonable success with a simple cream cheese and Halloumi. Mine was too salty at first until i diluted the brine. What was wrong with yours? The halloumi just formed a big cracked golfball and the feta was perfect until I put it in the brine solution, went on holiday and came back to find a box full of (over) salty slime 😦 It’s a balancing act, the salty business. Had a taste today, couldn’t resist any longer. Pleased to report that ‘Shirley’ is very tasty indeed. Hardly any rind to speak of but it might well have after 4 months. Curiously though the blue is prominent where the spikes went in but hasn’t ‘branched’ at all. All this is irrelevant though i think cos it tastes very good IMHO. I think i’ve learnt that a cheese doesn’t have to be a copy of a well known existing cheese. This is how I make it too. One thing to add for newbies is that during the first few weeks the cultures can give off a strong ammonia smell. Don’t worry; it’ll subside and mellow into a nice blue cheese smell. I only mention this so that no one discards a perfectly good effort when they smell it at that phase. Thanks for the tip, Elizabeth. Mine did smell very strongly of ammonia but I wasn’t sure whether that was okay or not. It also got very slimy though, which was probably due to a humidity problem. I got lucky with just putting it in a plastic storage container in the vegetable crisper. My last batch was a little slimy but this one cut a nice blue fur all over it that seemed to inhibit that. After drying for the 4 days (and I *very* lightly pressed it) I just put it in without a paper towel or anything. The mold produces some liquid and so if it gets going will keep it hydrated. That’s usually the limiting factor for how long you age it; it becomes runny (queue Monty Python cheese shop sketch, “It’s a bit runny.” “I don’t care how runny it is…!) My current effort is three weeks old and it looks like 4-6 weeks will be ideal for it. Wish I could post a picture of “Sid”. She’s gone now. Stilton and chive scones,Beef& Stilton pies and best of all simply Stilton on toast which was absolutely delicious (hard to imagine a better cheese on toast. Trying to decide on next cheese now. It was just in the fridge in a tupperware, but it did get a little too moist at times. I will make it again in the autumn and keep it open in a non heated room. Exploded? Mine had a large crack but i didn’t worry about it .Thinking about a Gouda, Lancashire or Wensleydale. Great story. I am looking forward to learning how Trevor turns out. But, I am impressed that you tried!! Keep up the good work.